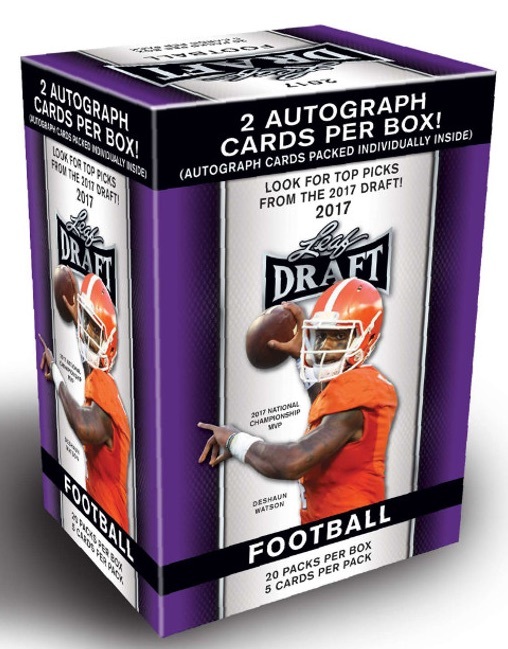 The earliest option for pre-draft collectors, 2017 Leaf Draft Football is a simple set issued in a retail format. Each blaster box contains a pair of signed cards with a chance at short print autographs. 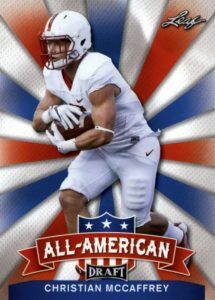 Covering some of the biggest names heading into the '17 NFL Draft, 2017 Leaf Draft Football has a 69-card base set as well as a Gold parallel. However, the main appeal for most collectors stems from the large Autograph set. Totaling 153 subjects, over a third are designated as Super Short Prints (SSP). There are also limited Gold parallels which each have a print run of less than 150 copies. The autographs are not found in the regular packs and instead come separately in toploaders. 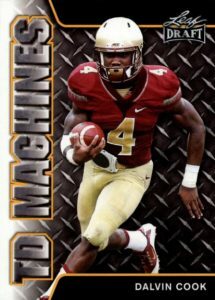 In addition, basic insert choices include the colorful All-American set for 17 elite players, as well as 14 more options in the metal-themed TD Machines. These also have Gold parallels. 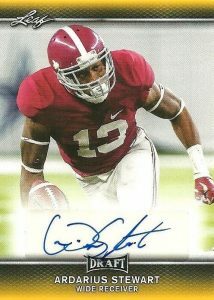 UPDATE (5/17): Leaf announced a separate format for signed production plates from 2017 Leaf Draft Football that includes one card per pack. 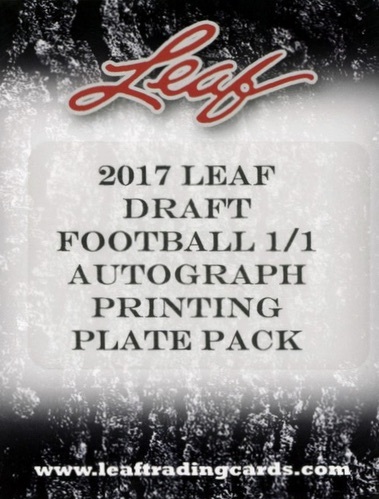 The 2017 Leaf Draft Football 1/1 Autograph Printing Plate product is limited to just 584 total packs. 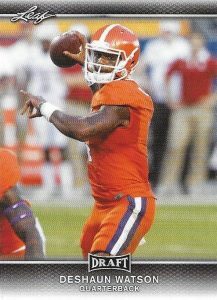 Led by Christian McCaffrey, Deshaun Watson and John Ross, each pack includes a one-of-one printing plate with a signature. 153 cards. Shop autographs on eBay. Short prints noted: SSP = Super Short Print. PARALLEL CARDS: Gold (less than 150 copies), Printing Plates 1/1 (Autographed Plate Packs only). Details will be added if provided. Shop on eBay. Nice bulk amount of cards , good assortment with inserts and gold versions to find. Autos are always well protected and grade well. Some higher value cards can be pulled but most likely you will not find too much of real value , these are great for kids , people who need cards to get autographed , collectors willing to risk $20 on a slim chance at a big auto. Cool thing is sometimes this product has guys other sets miss on. I wish Leaf had NCAA logos but they still try to use good photos. I’ll give it a 4 cause of inserts.. would be a 5 if the autos were inside the packs and not packaged Individually.. another thing I hate is many no name guys get autographs and aren’t even in the base set.. if you’re not good enough to be in the base set, you’re not good enough to have an auto..
Seen a few of these boxes and decided to pick one up. Short version I got a parallel (yellow) card version of an autograph of Ethan Pocic who plays on my favorite team Seattle Seahawks. How ironic is that? Nonetheless I gave a 3 star rating due to the cards not “popping” as you would think being these are rookie drafts and what not. I noticed a parallel base version which was gold (yellow). Not sure what kind of premium this brings, but the card is more attractive than the base. I got no serial number cards or flashy shiny parallels which was kinda disappointing from a great product like Leaf. Overall the two autographs were a nice touch. Especially getting one from my active team lol!